There is an interesting paper recently published in the prestigious journal Conservation Biology by members of two National University of Singapore (NUS) labs titled “A robust non-parametric method for quantifying undetected extinctions” that came to our attention. In it, they presented a novel method of estimating undetected extinction, i.e. the type of extinction events that may have taken place without humans taking note of them. They applied this new method to all 195 breeding bird species ever recorded in Singapore over the last 200 years. Of this number, 58 (~30%) are known to have gone extinct. They project probably another ~10 species have gone extinct without ever being discovered, thereby providing a more realistic extinction rate at ~33%. The extinction of one-third of our resident bird species over the years represent a significant loss of our biodiversity. The authors also project based on the data from Singapore, an additional 14-16% loss of bird species in the region by the year 2100 with current deforestation rate. Some of our favorite birds are already extinct in Singapore. More will join their ranks without further conservation efforts, and it won’t be long before they are gone for good in the region as well. One of the interesting side product of this new study is a new, extensively vetted list of all breeding birds ever recorded in Singapore based on thorough literature reviews going back to the 1800s. Reproduced with permission at the bottom of this post is a table containing the bird list of current and extinct species. This data represent a best effort by the authors at the time of publication. This website will use it as a starting point to update its own list in the future. Chisholm R.A., Giam X., Sadanandan K.R., Fung T. & Rheindt F.E. (2016). A robust non-parametric method for quantifying undetected extinctions. Conservation Biology. Table A1. Resident native birds of Singapore recorded since 1819. This list excludes species that were introduced by humans or for which evidence for breeding activity is too sparse. Some species for which breeding evidence is doubtful are included in the table but were excluded from the analysis described in the paper. With the explosive growth of bird photography as a hobby in Singapore in recent years, it is hard to imagine a time when the number of local bird photographers can be counted with the fingers of one hand. That was the case in the 1990s, in the days before the Internet, social media and pervasive connectivity. There was no one to tell you about the latest birds sightings. You have to just get out there (often alone) and master your fieldcraft and if lady luck smiled on you as well, you get your reward. It was also the age of film and slide photography, and no instant gratification in photo playback or rapid firing of successive shots of digital cameras that we take for granted these days. Looking around at the bird photography community these days is to see a predominantly male pursuit with heavy, long supertelephoto lenses and the latest expensive professional camera system. So it comes as a surprise that one of the few bird photographers back then was a petite middle-aged woman with modest equipment. Her name was Ong Kiem Sian. An optometrist by profession, she started bird photography at a late age, prompted by the call of adventure in 1990. And adventure was what she pursued, with vigour, persistence and patience. In the course of her hobby, she waded in thigh deep waters, trekked for hours in the wild, endured leeches in tropical rainforests, all for the perfect shots. Something that most serious bird photographers can relate to all too well! Many of her friends have described her as a tireless, curious and enthusiastic nature lover that went well beyond just getting a photo of a bird. I came across her photo book “A Passion for Birds” a few years back. Flipping through the pages, one could see her mastery of the craft, with beautiful bird pictures, some very rare species and even rarer moments captured, many of which have stood the test of time. Technology may have greatly advanced since then, but between the pages of that book, are images that other photographers can only hope to emulate. In doing research for this website, I was looking at some of her published photos, and was amazed that her local owl photo collection included the Short-eared Owl, a very rare winter visitor to the island and she managed to get a beautiful picture. Next to that owl was another species of owl. In those days, it was referred to as a Brown Hawk Owl. Just last year, based on latest research, that particular owl could be a Northern Boobook instead, a new bird to the Singapore checklist. So indeed she was a lady way ahead of her time. I have elected not to write too long a story, but to let the lady and her photos speak for themselves. At the end of this article are links for further reading. Her book is sadly out of print, but I have asked and obtained permission from Morten Strange of Draco Publishing to reproduce some pages to share. In the Gallery, click on the “View Full Size” link on the bottom right hand corner to get a bigger scan image. Ong Kiem Sian passed away on 14 June 2009 at the age of 63. She is fondly remembered and regarded as the first lady of bird photography in Southeast Asia. Although on the surface it seems that we have slowed down somewhat the completion of the write-up for the various species, the truth is that there have been a lot of work going on behind the scene. For example, we have now included where possible, the link to the IUCN Red List assessment page for each species. There are of course a few species without any such link. The simplest reason is that IUCN list is derived from the BirdLife International checklist, whereas our Singapore list is derived from IOC. There are differences in what constitute a species and their range between these two lists. The most apparent example is the Javan Myna in our Singapore checklist which is our most common introduced bird species. There is no Javan Myna in the BirdLife/IUCN species checklist because it’s lumped with the White-vented Myna that is very abundant in Indochina. So it is listed as Least Concern. Yet, the Javan Myna is a rare bird in Java (personal communications), its home ground. So linking it to the White-vented Myna IUCN page is not the correct solution, as that misses out the story of its decline in numbers. On the bird photos front, we have as of today covered about 100 species, or approximately 25% of the bird species in our list. It’s slow work as uploading and checking each photo takes time, but we are getting there. Our back of the paper calculation shows that collectively there are 346 species in which photos exist of the species taken in Singapore. So a further 50 species were sight records only. That means we have to supplement these with photos taken elsewhere. This is especially true of the migratory waterfowls that no longer have suitable habitat to winter in our region. So our head writer See Toh is now in Tokyo looking hard for ducks to photograph! In the meantime, the IOC checklist version 6.1 just came out. Our cursory checks shows no further taxonomic updates that affect Singapore birds. If there are any changes, we’ll hopefully be the first to cover it. A Beach Stone-curlew from Bali. There exist a pre-digital distant photo of this species by Alan OwYong, and that is the only photo record of this very rare resident species in Singapore. So it’s necessary to supplement it with bird photos from overseas. When I started taking birding seriously in 2010, information about birds whereabouts and what sort of wild birds there were in Singapore was hard to get. At first I relied on Wikipedia which list out all the birds that have been seen, and where they are likely to be found. Forums like Naturepixels and NPSS where bird pictures were shared were also sources of information about the latest birds found. Soon after, Facebook groups started sprouting up and I joined a few. That took the interest to another level with latest sighting discussed in closed group free from prying eyes. Whatsapp chat groups soon replaced SMS and one can instantly know what’s the latest news about any new birds. Social media and technology have totally changed the way one approach birding in Singapore. While fieldcraft and technique matters to the serious birders, one can do birding quite well with just knowledge of which Facebook group or Whatsapp group chat to join.For the lists of birds found in Singapore, the choices was rather limited for the longest time. There is Wikipedia and there is Nature Society’s bird checklist. The latter being more authoritative yet the nomenclature used was strange. Both were available in format incompatible with how I kept track of my own burgeoning bird count. I had mine in a relational database with easy sorting of birds and all the benefit that comes with it. Wikipedia format made it difficult to transfer all the birds into the database easily, and the NSS one was in PDF which was also needlessly difficult. Nonetheless one day I managed to write a script to convert the NSS checklist into my database format. With that came the ability to easily find out which birds I do not have, their relative abundance, and the start of my picture database. More importantly, I started to do a Singapore Big Year in 2012, and it was important to keep a separate Big Year list to help me track my progress in that competition. With the help of the database, the newly incorporated NSS checklist, and a list of possible location for each species, data analysis became much easier and more powerful than the pen and pencil approach that others were taking. All was good, except Javan Myna was a White-vented Myna, and an Intermediate Egret was a Yellow-billed Egret in the NSS checklist and a whole other list of strange names, and keeping track of these difference took up my time. So one day I decided the best way forward was to stick to IOC nomenclature as they publish an updatable world bird list, and painstakingly go through every entry in NSS checklist and convert them into IOC names. With that completed, I joined Singapore Big Year 2014. Armed with a revised Singapore checklist, I was constantly updating the database with my bird count that year and my guesstimate of my rival’s species count. A running species comparison between my 2012 effort and the 2014 also let me pace myself better since my work load had increased since 2012. I was also able to track everyone’s progress easily once I keyed in their data. That’s what a database is meant for; to query out useful information. So much so that by mid-November that year, I already knew I was 5 birds ahead of my nearest rival and that was enough to win the competition. My Singapore checklist proved very useful to me, and so I published it in Excel format since 2013 for others to use. Since then, the checklist had been continually updated with new features and capabilities. It seemed to me the basic usage for a checklist have changed over time. For example, I have never physically printed out the checklist because I don’t do data entry by pen and pencil. Therefore a checklist in PDF format did not make sense to me. At least in Excel format, one can cut and paste the bird name to search for more information elsewhere. I thought wouldn’t it be good if we can do automatic links to those those websites for each species? With that realization, I started providing those links. The rationale for putting in names in other languages was very simple, there were requests for them and it made sense. With all these information already incorporated into the database, it seems logical that when we started the Singapore Bird Project, the database and the checklist it produced would form the foundation for the new website. I’ll talk more about the database in a later article. One of the pitfalls in nature photography in the digital age is that we take way too many pictures to manage and somehow, when asked to retrieve something we took 3-4 years back, we’re stumped as to where we put the picture files. Thankfully if we are using Adobe Lightroom, there are many ways to organise the files. Using a combination of Lightroom and simple storage in Google Drive, I have manage to save significant photos of the birds organised by their English names and quickly retrievable and shared with those who want them. 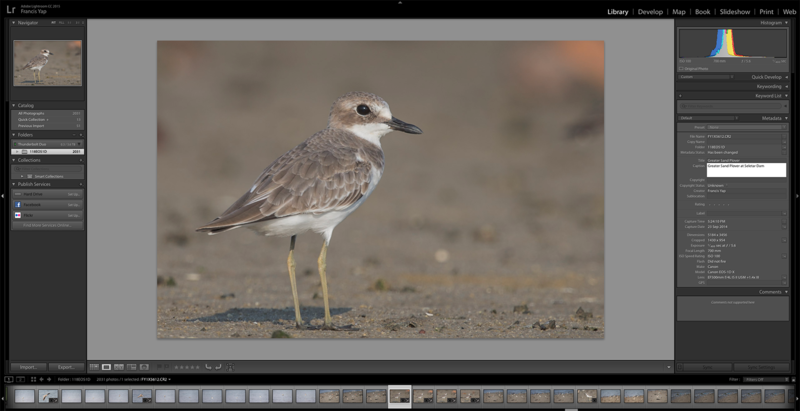 Today’s example is the processed Greater Sand Plover pictures stored as above in Google Drive, named in a logical way, bird_name-date-rawfilename-folder.jpg together with the rest of the other bird species (see above). This means at a quick glance I can sort out quickly my processed photo library by the bird name, when it was taken and which folder the original RAW file is kept. How to go about doing it without significant effort and with other added benefits? The above is the original file being processed. You can see that the RAW file name and folder at the bottom left. 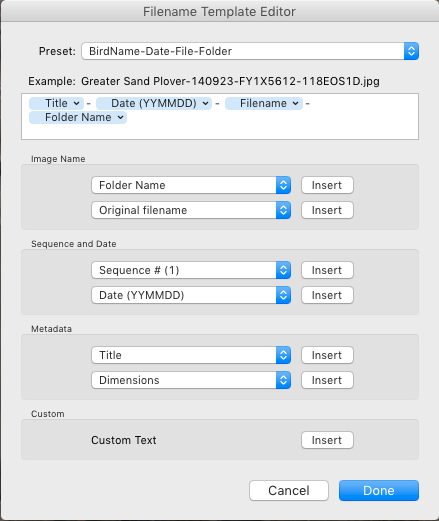 Since I want to keep a processed copy of this file, I go to the Library tab, and put in the bird name as the Title in the Metadata section, and the description I want for this bird at the Caption box (see white box above). 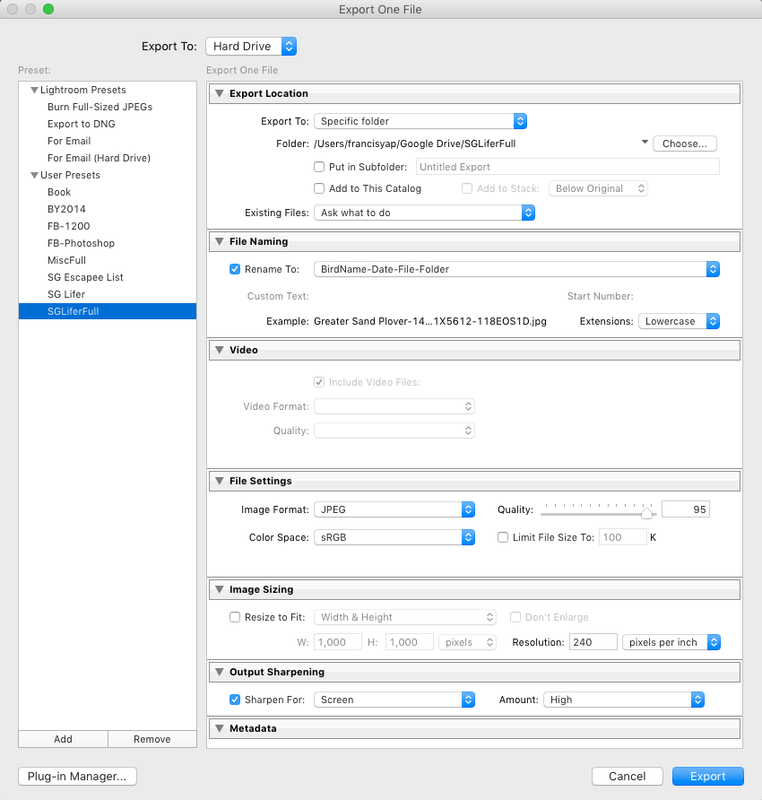 Then when we want to export, we go to File > Export menu and a Export One File dialog box appear. You noticed that I rename the file with a custom name. This is a preset created by clicking on the rename combo box. This will open up the Filename Template Editor. You will see the various options displayed and you can customise to your heart’s content. Since this preset can be saved, the next time around, you can just reuse it without doing anything at all. So it’s just a one time effort. What’s the benefit of this way? Perhaps a simple renaming manually will be easier than tinkering? For one, by doing all these steps, you are basically able to filter out the bird name in the Lightroom catalog in the future. Also, if you were to upload to Flickr, or your own Facebook Photo Album, the Title and the Caption will appear automatically. The same thing happens in WordPress and other sites that can read the metadata. So if you were to share your file with these things tagged, you will have an easier time filling in details of something you took ages ago and probably cannot remember fully any more. Hope this helps you in organising your picture library. Please pardon the atrocious writing style. This was meant as a quick and dirty write-up. The team in the Singapore Bird Project had been busy posting bird species update for the past week and we now have a total of 10 pages worth of detailed description of the various birds. We have completed the Paradise Flycatchers and in the midst of completing the swifts and swiftlets family. Today, we’ll like to show you the new additions to the website. Firstly we have an online Singapore Bird List now, with brief description of every birds in our checklist (396 so far) and appropriate links to the various resources to help the birders in identifying and understanding the bird species. We’re also issuing a new checklist in Excel format that is easier to understand and provide linkages back to this website so that you can keep current with the latest updates and changes. Last but not least, we now have a Contributors page that list down the various people helping out. It’s still a short list, but we hope to change that soon. Since the website has just begun, it’s good to remind everyone that we will strive for accuracy and completeness. Nonetheless we realise that with every project, there are bound to be mistakes and inaccuracies. Please do leave a a message and we’ll correct those promptly. 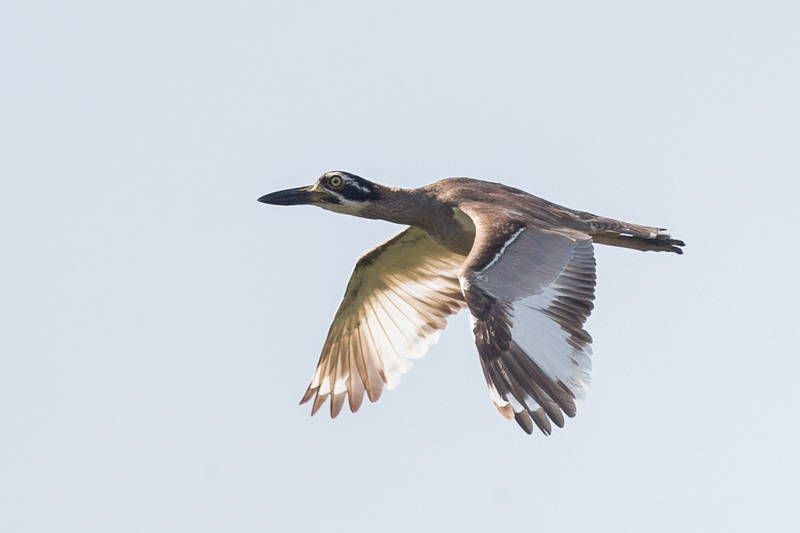 The Singapore Bird Project main aim is to document all the wild birds in Singapore. Every species will have its own page. For example the Grey Wagtail page is https://singaporebirds.com/grey-wagtail. For now they are not organized, but there will be a landing page where all these species pages are plotted out. The other section is the blog which is located at singaporebirds.com/blog and is accessible using the main menu. The blog itself contain the more general postings. These may include project status updates, special posts about bird behaviour, round-up of bird news etc. Whatever that is related to birds in Singapore. The last menu item is the Singapore Bird Checklist where the latest checklist is available for download in Excel format. There will be more content coming soon at that section, as this website is developed.